The cloned dinosaur? This is the picture that circulated with the rumor. On March 30, 2014 a rumor began circulating that scientists at Liverpool’s John Moores University announced they had cloned a dinosaur. Their story has not been verified. 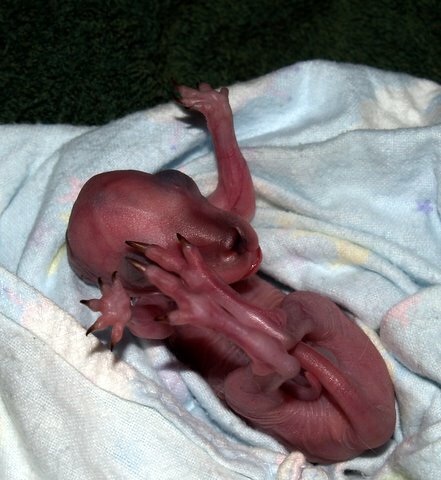 And the baby “dino” photo looks suspiciously like that of a baby kangaroo. But with the success or even near success of scientific adventures like this, important ethical and practical questions arise. Just because we can bring back animals that are long extinct, should we? Why? Wooly mammoths would be a relatively easy species to resurrect; their DNA is younger. 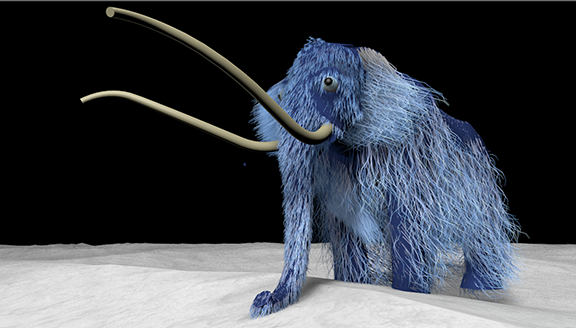 What would happen to an animal like the Wooly Mammoth—and to the animals near it? And if we can bring back extinct animals, should we also bring back extinct species of humans? Animals help habitat. When Wooly Mammoths lived in what is now Siberia, the land was covered by tall grass, which depended on the mammoths’ hooves to churn the soil. Eleven thousand years after the Wooly Mammoth disappeared, that part of Siberia is tundra—a wetland of short mosses and grasses that, as it turns out, releases large amounts of the greenhouse gas, methane. So, as the argument goes, bringing back the Wooly Mammoth may stop the release of methane over a huge area of land and thereby reduce global warming. Advocating and working for de-extinction may relieve some people of the guilt they feel about being part of a species that has driven so many of its planet mates from the face of the earth. Some scientists argue that the techniques that are being perfected in the de-extinction effort could be used to help save the polar bear, the spotted owl, the California Condor, and the more than 22,000 other species that the International Union for Conservation of Nature and Natural Resources has identified as threatened right now. There’s only so much money to go around. Available resources might be more helpful to today’s threatened species if they were spent directly on those species and their habitats. We have made no provisions for how to humanely introduce individual animals of resurrected species into the wild. Some animals would need to be protected from predators. Some would threaten the animals already living in whatever habitat they are introduced. Some would threaten humans. And, almost by definition, animals from resurrected species would compete with modern animals for available food and water. It could be a wildlife disaster in the making. Mammals and some birds especially need parents. If we resurrect an Ice Age species like the Wooly Mammoth, who will teach those babies how to live in icy places? Probably not the African elephants that would gestate them. Hatching a dino from an ostrich egg would be a huge step forward. Bringing the baby beyond its first hours of life might be harder still. In 2003 scientists in Spain cloned a member of an extinct species of mountain goat. The very last of these goats was a female who had died only a few years before, so her preserved DNA was viable when the scientists introduced it into the eggs of modern goats. Seven pregnancies resulted. Six ended in miscarriage. One goat was born, but lived only 10 minutes. And in 2011 scientists in New South Wales tried to bring back a fascinating frog. It’s called the Southern Gastric Brooding Frog because it’s a southern hemisphere frog and because the female incubates her entire brood in her gastric system. Rather than spewing her fertilized eggs into water, she swallows them. Then she starves herself for the six weeks it takes the brood to grow. Carrying 20-25 babies, her stomach gets so big that her lungs collapse and she has to breathe through her skin. When it’s time to give birth, she vomits everybody out. This frog went extinct in about 1981. Mike Archer, a conservation biologist, got as far as getting embryonic cells of this frog to divide hundreds of times. But then, for reasons he has yet to figure out, they stopped dividing. Aside from questions about the practicalities of de-extinction, ethical questions have to be considered. For example, if we learn how to bring back extinct animals, should we bring back extinct humans? Most scientists agree we should not. Neanderthals died out somewhere between 33,000 and 45,000 years ago. Their DNA may still be viable. But by law—very good law, in virtually everyone’s opinion—experimentation on humans requires informed consent. Neanderthals are not around to give it, and there’s no reason to believe they would give it if they could speak from the grave. How would we help Neanderthals manage their lives? They would be far outside the norm physically, and maybe cognitively and emotionally, too. Would they be metabolically ready to deal with the environmental toxins in the modern world? Why would we want to create the life of a medical and social freak for anyone? It’s a question that gets asked a lot, but right now there seems to be one answer—NO!